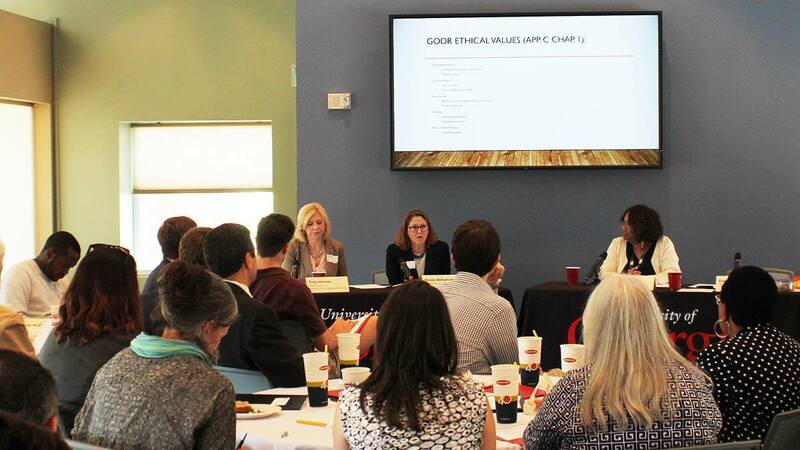 The event was co-hosted by the Association for Conflict Resolution, and the panel featured Wendy Williamson; Tracy Johnson, Executive Director of the Georgia Commission on Dispute Resolution; and mediation trainer Raye Rawls of the J.W. Fanning Institute for Leadership Development. The most exciting aspect of my experience was meeting the new generation of future lawyers who are committed to growing ADR and mediation not only in their practices but also in our communities. It was exhilarating to feel hope and excitement about the future of mediation which has come so far in my lifetime but has even greater potential in the courageous and innovative hands of UGA Law School’s future graduates. Thanks to the efforts of Professor Lanier and Jeremy Akin, a 2nd year law student, UGA Law has its first ADR Society linked to the Georgia Chapter of the Association for Conflict Resolution. I watched Jeremy Akin grow up and Jeremy served as an intern at the Mediation Center in Savannah during his college years. Jeremy went on to conduct research as a Fulbright Scholar around mediating land disputes in Uganda for three years. It was especially moving for me to see Jeremy take a leadership role at my beloved alma mater to promote mediation education and community.